If you’ve been injured in an auto accident, it’s important to visit our practice as soon as possible. 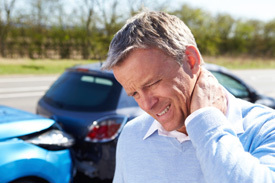 While many patients believe they might be “fine” and not show immediate symptoms of pain following a crash, it’s important to understand that injuries like whiplash, joint damage and other under-the-surface problems can take weeks or months to show pain. The best thing you can do for your body? Get ahead of pain before it begins. Our practice is also happy to work with patients on a lien basis, which means you don’t have to pay for a dime of your care until after your insurance company reimburses you for the damage done. In addition to resolving problems before they become too serious for repair, here are a few ways chiropractic after a car accident can help. It reduces inflammation in the body. After an accident, it’s extremely common for inflammation to flare up in your body—after all, it’s just experienced a serious trauma. Restoring proper alignment to your spine helps to calm inflammation, therefore reducing any pain you may be experiencing. Prevent future degeneration. When you visit us for a series of adjustments after a car accident, we’re able to restore your spine to full function, which means it won’t be as susceptible for further degeneration caused by injury. It can help with insurance claims. We’ll be sure to record all of your injuries, which can help as they’ll be documented by a certified medical professional if you ever have to go to court after dealing with a reckless driver. It’s our top priority to help you recover and live a happy, healthy life. Contact our practice to book your spinal evaluation and adjustment if you’ve been in a car accident recently.